Griesheim in the Palatinate, Germany (coordinates: 49° 51′ 50″ N, 8° 33′ 50″ E), is mentioned in 1732 as a Mennonite congregation, with Hans Burkhalter as preacher. Later on in the 18th century the Griesheim Mennonites belonged to the Ober-Flörsheim congregation. Hoop Scheffer, Jacob Gijsbert de. Inventaris der Archiefstukken berustende bij de Vereenigde Doopsgezinde Gemeente to Amsterdam, 2 vols. Amsterdam, 1883-84: v. I, Nos. 1248 f., 1472. Zijpp, Nanne van der. "Griesheim (Hessen, Germany)." Global Anabaptist Mennonite Encyclopedia Online. 1959. Web. 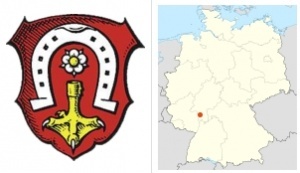 23 Apr 2019. http://gameo.org/index.php?title=Griesheim_(Hessen,_Germany)&oldid=109109. Zijpp, Nanne van der. (1959). Griesheim (Hessen, Germany). Global Anabaptist Mennonite Encyclopedia Online. Retrieved 23 April 2019, from http://gameo.org/index.php?title=Griesheim_(Hessen,_Germany)&oldid=109109. Adapted by permission of Herald Press, Harrisonburg, Virginia, from Mennonite Encyclopedia, Vol. 4, p. 1088. All rights reserved.